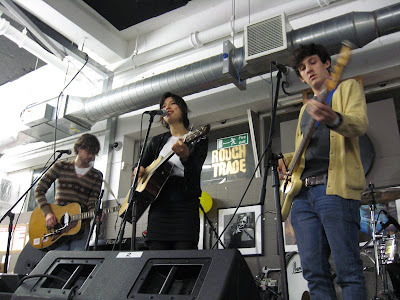 On Thursday evening my diary was looking pretty empty so I decided to head out to see Emmy The Great play a free instore gig at Rough Trade East. Arriving early (sometimes the queues stretch around the corner of the street) I gathered my wrist band and headed off with my impossibly small but incredibly useful eee pc laptop and a sandwich to do a little pre gig research on Emmy. Starting with her MySpace page, I listened to the play list which not only contains her own material it also has really good covers of Ash’s “Burn Baby Burn” and The Pixies’ “Where is my mind”. More searching uncovered a wikipedia entry and I think this is usually an indicator that a singer has been around long enough to earn a decent fan base so I was quite surprised to read that although she has supported the likes of Martha Wainwright, Mystery Jets, Tilly and the Wall, Jamie T, Euros Childs and Kimya Dawson and has collaborated with Lightspeed Champion and The BPA amongst other artists, she is yet to release an album so far, limiting herself to just a few singles and downloads. Anyway, words can only help you get a feel for a band so far, the proof is in the pudding so to speak and with that in mind I claimed my spot on the floor in front of the stage and waited for the concert to begin. 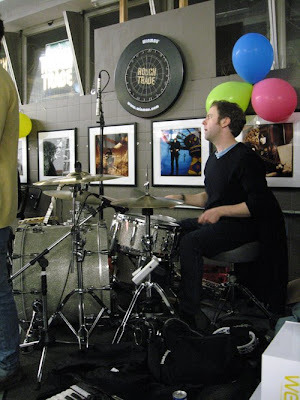 There was a decent turn out and for the first time in all my experiences of Rough Trade instore concerts, nearly everyone stayed seated, even after the performance had begun It gave me a sort of nursery school/Pete Seeger vibe which felt nice. I’m a bit tall (for a girl) so realizing the folks sitting behind wouldn’t appreciate me standing through the show, I skulked up against a wall and tried to grab a few photos. 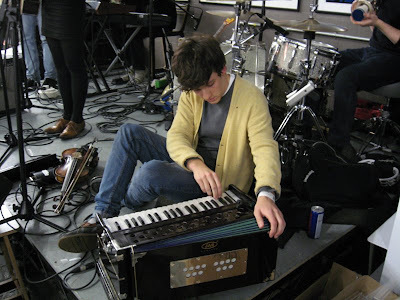 There were a whole myriad of instruments squeezed onto the tiny stage including a harmonium, a mandolin, keyboard, guitars, drums, tambourines and last but not least… an egg shaker. I did spot a cello case but no sign of a cello. 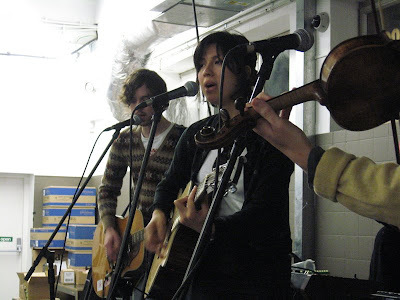 Emmy The Great (real name Emma-Lee Moss), accompanied by four band members, kicked off with her latest single, released only a few days prior, called “We Almost Had A Baby”. I’m struggling to think of who Moss reminds me of. LastFm suggests if I like her I might also like Laura Marling, Florence and the Machine and Diane Cluck and I can see how the anti folk vibe might influence a computer to recommend these artists but this doesn’t really put a finger on it. Emmy has a lovely voice which can, at times, make her songs sound quite twee but if you listen a little closer the lyrics are often telling a story, sometimes quite thought provoking, and not necessary as sweet as her soft voice might lead you to think. I felt the subtleties of her lyrics were a little lost on me, due to my lack of familiarity with the songs. It was a shame really because I think this is a big part of the attraction with this band. 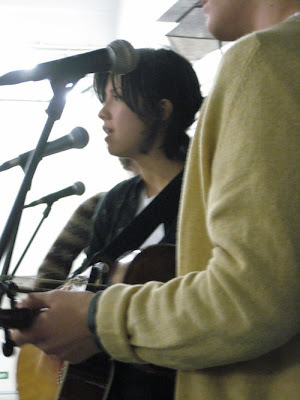 They played seven songs including “the myspace page ones”, as Moss put it, and a song called “First Love” off their forthcoming album of the same title which was inspired and based upon Leonard Cohen’s song “Hallelujah”. 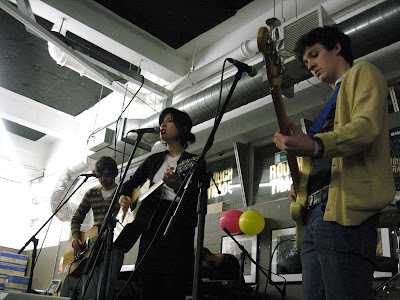 Occasionally Moss added a few comments between songs, like how she’d hoped to buy some CDs while in the shop but couldn’t find the new release section, and how they should make it more obvious which she quickly followed up with “ They’re not going to invite me back her again are they?”. She also mentioned how excited she was about having tickets to see Leonard Cohen at the O2 later in the evening and how the drummer had eaten some dodgy chicken from a food joint around the corner – I think I know which eatery she meant but I’m not going it name it here. Most of her supporting band members are also involved in other projects, Euan Hinshelwood plays for http://www.myspace.com/younghusbandmusic, Euan Robinson plays for http://www.myspace.com/thestarsofsundayleague and Ric Hollinbery with http://www.myspace.com/thisispengillys , all thoroughly decent bands you should check out. Although I did enjoy my first Emmy The Great experience, I'm not sure I'm completly sold on them yet, the jury is still out. Emmy The Great has just released a single called “We Almost Had A Baby” which you can get a copy of at Rough Trade records (which apparently comes with some great artwork and is limited to 750 copies) and is expected to release her debut album titled "First Love" in February 2009. Here is a new collaboration between The Brighton Port Authority (Fat Boy Slim) and Emmy The Great which I'm enjoying more with every listen. I'd recommend you check out Emmy The Great's "Secret Circus EP"- it's quite different to the stuff she played last week, more delicate and folky, and the title track's just luvverly.